Many brides and grooms fantasize about a tent wedding at home, but when it comes time for the actual planning, they find that pulling off this type of affair is complicated—not to mention expensive. With that in mind, many reception venues are now offering tents set up directly on their grounds. What makes the tent wedding so appealing? Many couples like the idea that their guests won’t be confined to one room for the entire reception. Instead, they have the freedom to wander in and out of the party, while still enjoying the festivities. “Guests can go smoke a cigar under the stars, but they are still close enough to watch people dance and listen to the music,” adds Rodriguez. And while reception halls already come with a set décor, tents are a blank canvas where brides and grooms can easily incorporate their theme and personal style. 1- The ivory tent at Crossed Keys Estate in Andover is draped in white fabric and white lights inside, allowing couples to add in any color bursts or decorative elements that suit their fancy. With a beautiful view of the mountains, the tent already comes equipped with a bluestone floor, seats up to 250 guests, and is available from May 1 to mid-November. 2-Couples that wed at the Ocean Place Resort & Spa in Long Branch usually opt to have their ceremony right on the beach, then host their reception in a tent set up on one of the property’s two open-air patios (weather permitting). “It allows our guests to continue that outdoor feel into the reception,” says Leah Monastra, senior catering sales manager. 3- Oakeside Mansion in Bloomfield has a 200-guest tent located right off of the venue’s wraparound porch so guests can easily utilize both areas. It offers carpeted floors, a crystal chandelier, sidewalls in case of inclement weather, and is available from April to November. 4- Branches Catering in West Long Branch will cater your tented wedding among the vines of one of their venues, Laurita Winery in New Egypt. 5- Park Avenue Club in Florham Park offers two tent-like pavilions on its property. The larger one seats up to 270 guests and features an air-conditioning and heating system, so it is available year-round. Its neutral décor allows couples to play up their own personal color style and theme. 6- Windows on the Water at Frogbridge in Millstone offers a fully enclosed, heated lakefront tent with a very large dance floor that can accommodate more than 300 guests. It’s attached to their banquet hall and has full walls, so there’s no worry about bad weather ruining your day. Additional tent options include a fabric liner, uplighting, your monogram on the dance floor and lighted lounge furniture to create a club-like cocktail hour. 7. Knoll Country Club in Parsippany offers a tented facility for the cocktail hour that is connected to the east ballroom. It can hold up to 250 guests and is available from late March until late November (weather permitting). 8. The Madison Hotel in Convent Station will also rent a tent for weddings, although they prefer to host only tented cocktail hours because of space limitations. 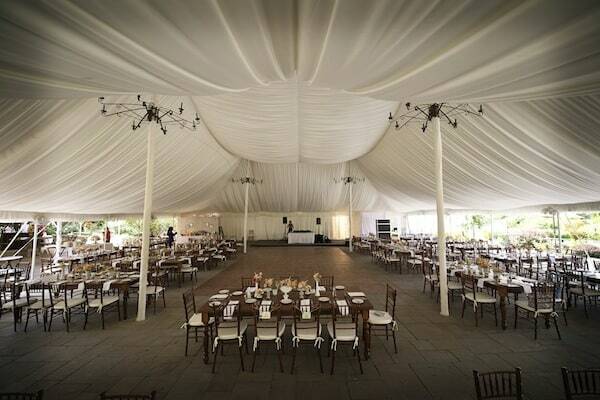 Smaller tented receptions are a possibility. 9. The Stockton Seaview Hotel in Galloway has a covered open-air pavilion that can accommodate up to 100 guests. It is not available in inclement weather. 10. Congress Hall in Cape May will rent a tent for couples, but only for weddings with more than 300 guests. Tented weddings can be held any time of year, although they don’t recommend December to February. 11. Water’s Edge in Sea Bright offers a private tent on the north end of the venue’s Beach Club, which can accommodate up to 100 guests (120 without a dance floor). It is available in the spring and summer months.